"I think I've finally, and thankfully, cut free"
KT Tunstall first blasted into the mainstream consciousness with a stomping live rendition of Black Horse & The Cherry Tree on Jools Holland in 2005. Later albums (2007's Drastic Fantastic and 2010's Tiger Suit) built upon the Scottish singer/songwriter's powerful performances and trademark rhythm guitar playing. Now new record, Invisible Empire // Crescent Moon - widely hailed as the best of her career - moves in the opposite direction. The new record is a world away from the heavy strumming of your debut. What inspired this gentler approach? "Certainly part of it was wanting to make an album about my voice, which is something I've not done before. It almost seemed strange when I came to it that I hadn't let my voice take centre stage yet. "I sang backing vocals for King Creosote and Jon Hopkins on the tour for their album Diamond Mine [in 2011], and it was just incredibly inspiring being a part of that: singing with them in these big rooms full of people who were completely silent and really absorbing gentle, crafted, beautiful music." You recorded in two sessions in Tucson, Arizona. What was the studio atmosphere like? "It was a studio called Wavelab run by a guy called Craig Schumacher. It's just a really magical place. It's right in the centre of Tucson and Tucson is very laid back… One of [producer] Howe Gelb's catchphrases is 'I'm never late, I just arrive ready' and, when you're recording to reel-to-reel tape [as we did], it makes perfect sense to work like that because you can record a song in three and a half minutes." How did recording to tape affect your performance and arrangements? "Tape suits a more stripped-back approach, because, basically, the more that you can play live the better. It's no longer about technical perfection, because you can't go back and fix anything, which is impossible not to do when you're recording on computer - the impulse to fix things is just too great. "Tape's a completely different headset of listening to music to hear whether you've got the feel of something right, as opposed to whether you've got the technical aspect right." Why do you think working with Howe Gelb was so successful? "Howe is an intensely creative, mischievous man. He is very maverick in his approach to music and has never been involved in that major label, analytical way of making music - where you're wondering whether it's going to fit into the current slew of whatever is out there - which I really appreciated. I think I've finally, and thankfully, cut free completely of that now - certainly with this record." Did you get to do any guitar shopping while you were in Tucson? "I really wanted to buy myself an old vintage parlour guitar. I've always played big guitars - my Gibson Dove and my Gretsch Falcon - but this record just felt like it would really suit a small, bluesy parlour guitar. But I couldn't find one, despite the The Chicago Store in Tucson being the most incredible guitar shop. "However, I was in LA last week… and went into the Guitar Center in Hollywood and just found my perfect guitar - the one that I'd been looking for. It's a 1959 half-sized Gibson and it's absolutely gorgeous. I've put an LR Baggs pickup in it and it just sounds brilliant." Your father sadly passed away during the sessions, when exactly did that occur? "It was in between [the two Arizona sessions]… It's intolerably hot in Arizona over the summer and it is, quite frankly, a health hazard to a Scottish person, so I knew that I didn't want to be there over the summer, but come September everything had turned upside down for me, so I postponed the trip back until November. Feel It All was the only song I wrote during that time. "The two sessions totally bookended what happened, but it was just very strange, given the first half of the record. It's definitely focussing on mortality in that first half of the record and there are songs about friends that I'd lost. "I think anybody would assume was about losing my Dad, but nothing had happened at that point. And also Old Man Song isn't about my Dad, it's about watching Robyn Hitchcock and Howe and Martin Carthy play on tour." Your Dad wasn't musical himself. Did he have an impact on your musical output in another way? "He and my mum were very supportive of me learning music as an art growing up. I asked for a piano when I was four and they allowed me to have one and put me through lessons. But neither of them were happy about me wanting to be a performer because it was a really dodgy way for me to make a living. "They grew up without the sense that it was a possibility to be a musician as a living, so my Dad was very much the 'get a job' Dad all through my 20s, but they were very, very proud once it all happened." You've made a very intimate record. Will the touring plans reflect that? "Yeah, I'm touring solo. I'm very excited to be doing that. It's perfect for this album. I'm still taking the loop pedal, so I'm not losing that completely… I also had a good chat with my booking agent and said that, 'This album needs to be played in interesting spaces', so I'm doing the Theatre Royal on Drury Lane and playing some venues that people may not have been to. "I'm fascinated by what the space does to the audience, particularly theatres - they really change the ambience. People, kind of hilariously, become very well behaved. You have to kind of encourage them to heckle. They start eating their crisps much more quietly!" 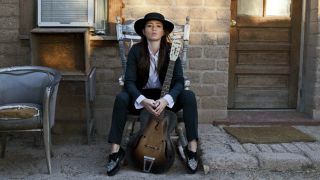 For more information, visit the official KT Tunstall website, or connect with her on Twitter and Facebook. Invisible Empire is out now.